Victrola label is proud to present Elvis’ powerhouse concert in Richmond Coliseum on April 10th 1972. Welcome to another spectacular ‘Elvis On Tour’ release, brought to you by the Victrola label. Our recent ‘Greensboro, April 14, ‘72’ release was very well received, despite some reviewers failing to point out the fact that we presented a genuine, recently prepared, unreleased mix of the show as well as unreleased bits and pieces of the rehearsals on disc two. 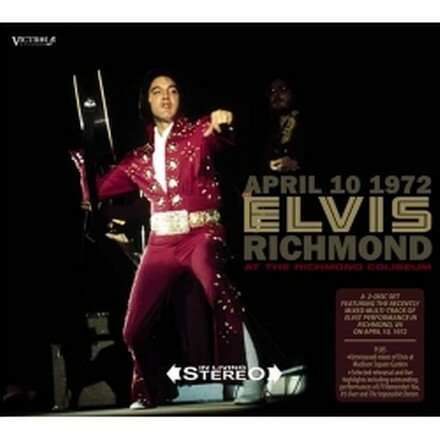 The April 10, 1972 Richmond, VA concert was released several times by various labels. Only two releases stands out: original 1995 Vicky label CD ‘Carry Me Back To Old Virginia’ - first ever release of this show in mono (incomplete) and 2008 Madison label CD ‘Red Hot In Richmond’ - first release in original 1972 narrow stereo (complete). Critics, predictably, will point out that this can’t be true because ‘Lawdy Miss Clawdy’ is still incomplete and therefore Victorola can’t be having an original recording and mix of this show. Well, in fact we do have that. We also have the original ‘On Tour’ paperwork from the vaults.